Spring is here, and with it, the Hunter Pace circuit–a fun way to keep the good times rolling with your foxhunting friends when the season is over, or to dip a toe into the foxhunting world for the first time. A hunter pace (also called a paper chase in some areas) is the least competitive competition of all time. I know because I’ve ridden them and done the scoring too! There’s no way to strategize, so earning a ribbon is just the cherry on top of a cross-country ride and a delicious tailgate. Of course, some people, hilariously, take it very seriously. To me, it’s an excuse to ride out over gorgeous country and school some XC jumps with your friends. How does a hunter pace work? 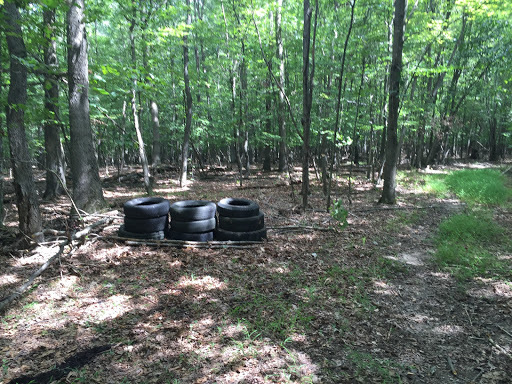 A team of 2+ riders navigates a marked course of 5-7 miles over trails and fields. The attire is “ratcatcher”–what foxhunters wear during the informal season (Tweed coat, coordinating stock tie, breeches and brown or black boots). Polo shirts or regular show attire are also typically fine, but this varies by club. There are various classes (flat, low jumps, high jumps) but the goal for each is to get as close as possible to the “optimum time”…which is not disclosed to the riders. Supposedly the optimum time represents a typical hunting pace for the country. So you have to guess when the hunt would typically gallop, or walk, or trot. Sometimes the optimum time is set by a person riding the course beforehand, and sometimes it is an average of all the times in the class (excluding the fastest and slowest times). Either way, it’s a crap shoot in my opinion. If you hunt, you know that the pace can be widely variable depending on the conditions and scent, so…there is no such thing as a “typical hunting pace.” If the optimum time is determined by an average, you have no clue how others will ride the course. 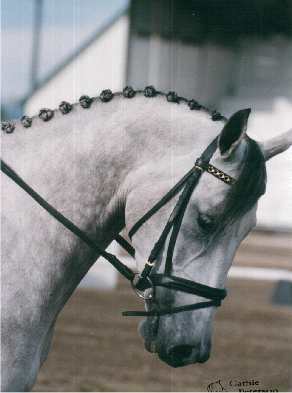 I have always found the best strategy is to just go at a pace that makes sense for an avid foxhunter. Gallop the straightaways, trot on trails with good footing, walk if footing is bad. You don’t have to jump everything if you don’t want to. You can even get lost, fall off, refuse jumps, and still win. In fact, you will see almost all of that in this video of my most recent hunter pace (aside from falling off, thankfully!). I left in the “oops” moments just to show that even after 4 years of hunting on a regular basis–my horse is not a saint and my riding is not impeccable. It wasn’t my best ride ever and that’s ok! You don’t have to be perfect to do a hunter pace and here is video proof! 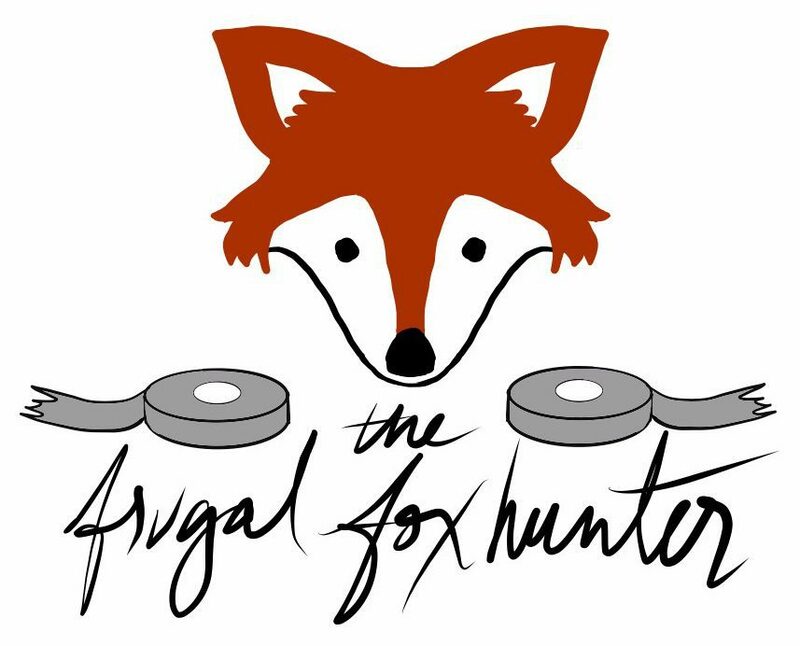 If you’re looking to get involved in foxhunting, participating in your local hunt’s spring or fall hunter paces is a fabulous and affordable way to get started. (The Maryland Hunter Pace circuit is $25/ride.) The best part is, if you’re just getting started, you can pick your own pace and you can choose which jumps you want to try. Completely low pressure and focused on fun! Have you participated in a hunter pace? Does it differ from how Maryland hunter paces work? Where’s your favorite course? So although The Leftist has been lame recently (abscess just would not pop; finally he’s on the mend and slowly getting fit again), I haven’t been completely absent from the hunt field. Rather, it seems I’m being recruited as a whipper-in. Phenomenal photo courtesy Pat Michaels. That’s me in green up front! When Potomac’s hunt season unofficially begins in August, correct attire is polo shirts. This is as much a mystery to me as anyone. My goal when out hunting is simply NOT to embarrass myself, to do the right things and just kind of blend in with the field. And of course to have a great time and come home safe. So I’m really not sure how I got noticed on my little brown horse but I suspect one of the masters in particular really wants me to do it. Being a teacher’s pet, I reread Foxhunting: How to Watch and Listen by Hugh Robards, MFH, per the huntsman’s recommendation. (I would recommend it to anyone looking to understand a typical day foxhunting from a variety of perspectives: the field, the whip, even the fox!) But even after reading that, I only had a vague idea of what the whips do. I assumed they flanked the hounds, kind of in a triangle formation, with the huntsman at the apex. This is completely wrong, at least when hunting with Potomac. Our huntsman assigns an area to each whipper-in depending on the territory we are allowed to hunt. Perhaps one whip will cover the road, to keep the hounds from becoming roadkill. Another might watch the boundary of a farm where we’re not allowed to ride. If we have a third whip, he might be responsible for watching an area the hounds might go that would change the plan for the day, and for calling the huntsman if that happens. Yes, our hunt staff does embrace technology to some extent, though they try to minimize calling each other and rely more on their senses–but if hounds are running full tilt toward the road, it’s better to communicate FAST. But a lot of the job is intuitive and impossible to explain. The whips have to use their judgement to decide whether to stay at their post, or move with the hounds as they cover different areas. This ability to judge where the hounds are going versus where they are comes with experience. So far I’ve whipped in three times–once on Lefty, twice on nice horses generously lent to me. Each time, I shadowed one of the whips. I noticed big differences in their style. One of our more experienced whips never seems to be in a rush. He’s always in the right place at the right time. He told me stories of how the fixture has changed over the decades, and knows how to traverse the country like he knows the hallways and rooms of his own house. The other whip I shadowed is younger, but still, very knowledgeable about the territory, and a phenomenal rider. I struggled to keep up with her and maintain any sense of order as she galloped across a field like her tail was on fire! There was no option not to follow, unless I wanted to be left behind. Thankfully, she was able to give me some pointers on galloping in the open with control (“Rearrange that horse’s teeth if you have to!”) Weirdly, this set my nerves at ease. I think there is something wrong with me. In any case, I’m not 100% sold if I want to start whipping in rather than riding in the field. I would need a different horse, since right now I half lease and Lefty’s owner wants to be able to hunt him in the field during the week. Most of the time, once you start whipping in regularly, horses really don’t like to ride in the field anymore–so that is completely reasonable makes total sense to me. And I enjoy riding in the field. That’s where my friends are, and if something goes wrong, there are people there to help, laugh at you, and pass you a flask. It’s actually hunting, not just following the group. You need the right horse. In fact, you need at least two horses–one that will ride in the field and one that will whip in. 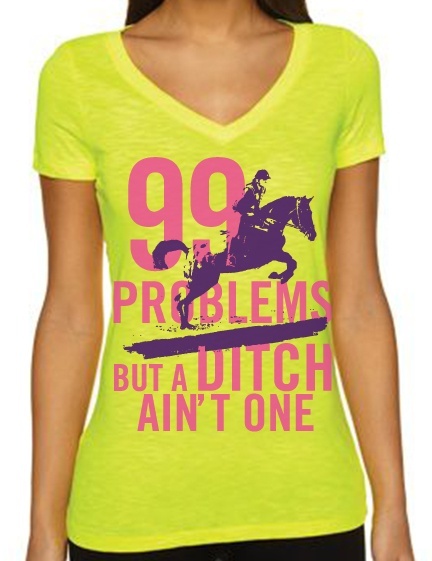 And preferably one for when those horses are lame. I have half a leased horse. You definitely need road studs or borium. You’re essential staff. You can’t go home early. Don’t want to turn my hobby into something stressful, with hunt politics, the inevitable mistakes I will make as I learn, etc. I know. It looks heavily tilted to the “Con” side. But I still asked my husband for a hunt whip for Christmas…not sure why…it might be that, as terrifying as whipping in can be, there is a little part of me that is thrilled to simply SURVIVE a challenge and relive those glorious moments over and over. Like the first time I whipped in on Lefty. We had a pretty quiet day, listening hard to locate the hounds at the periphery of the territory. We had a few little canters and jumped a few little things. Lefty was completely unfazed by an errant cow in the corner of a field. (I was more nervous than he was–a steer attacked me when I was a child, no joke!) It all seemed manageable. Until we were hacking in. 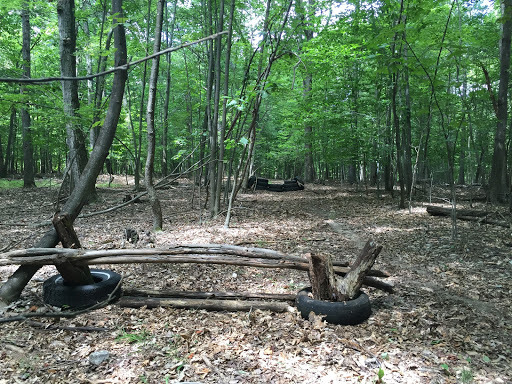 About 500 feet from the trailers, the hunt staff chose a path with what was essentially an Irish drain–a steep, muddy ravine that your horse has to slide down, rock back, and jump across. The huntsman crossed on foot with the hounds. One of the whips, behind me, held his horse. “You’ve got to GO,” she told me. She literally had a handful to deal with. I chickened out and peeled off to the side to let her go first (and give me a lead). It worked! Lefty carefully slid down, rocked back, and sailed across. I’m still riding that high of Lefty taking care of me, bringing me home safe. So I don’t know. I’m not in the market to buy a horse right now anyway…but I’ll definitely consider whipping in as a factor for when I do. Like I said, I have a problem. So I put myself to work instead building jumps. In the woods it was “lovely, dark and deep” like the poem. 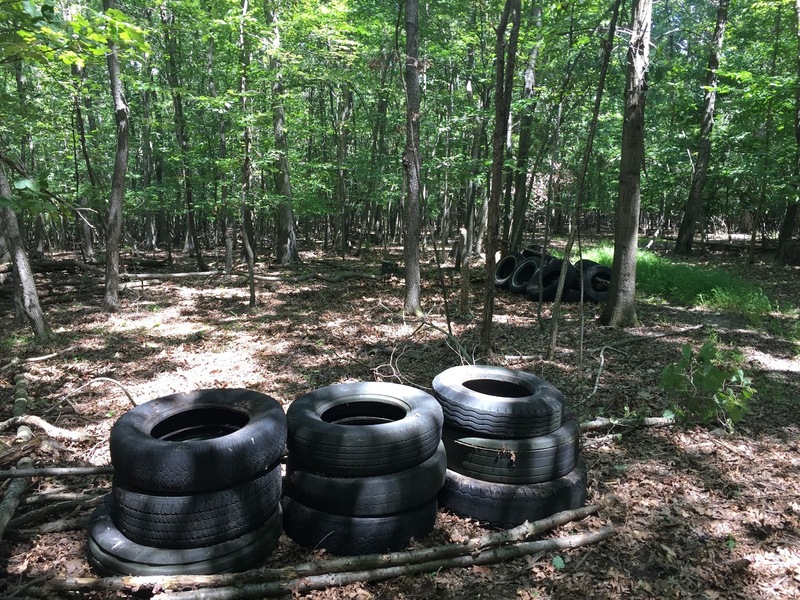 It felt significantly cooler than in the sun, but I was still definitely sweating moving around old, rotting tires!!! Here’s the first one I made! 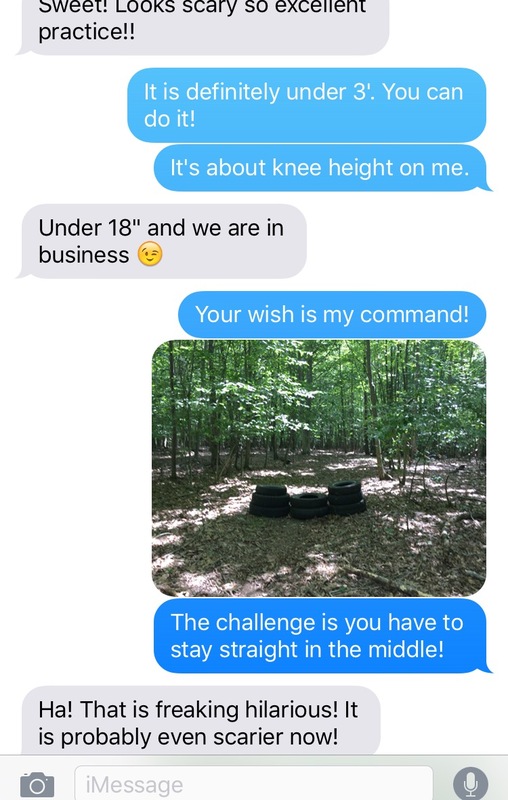 However I am not 100% sure my horse would actually jump what is basically a skinny the width of a tire, so I dumbed it down with guide poles. And added a second element, just because I couldn’t resist after finding the perfect-shaped stumps. 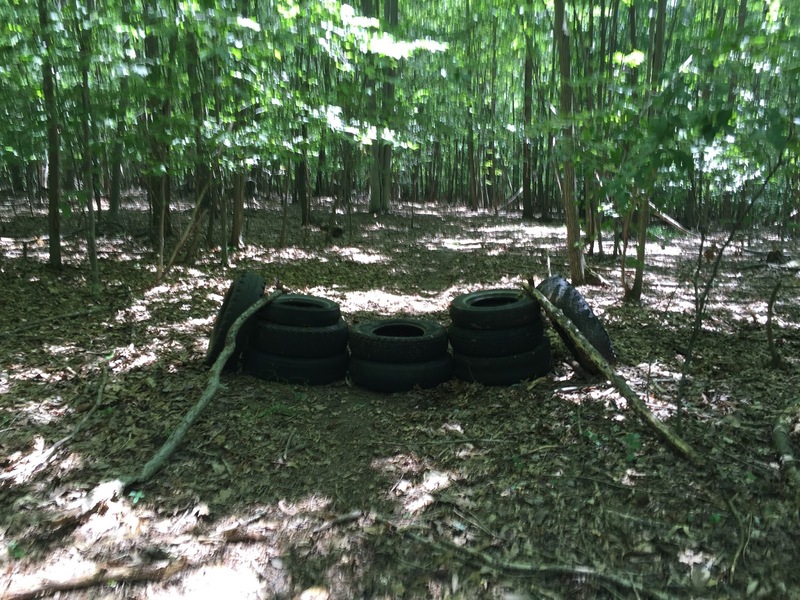 Then I went back and added a second element to the first jump for good measure (the tire coop at right, below). The heat was probably getting to my head at that point. I’m not sure if this last one will actually work out, just because of the approach–you need to jump into or out of it at a 90-degree angle to the main trail–but I think if you start with that coop, then the vertical will actually be very inviting. We’ll see how it rides when it gets cooler. Unfortunately that won’t be until the end of the week–and then we will be starting cubbing! I will ride really early a few mornings this week, but I typically stay in the ring when I ride before work. I want the morning feed person to be able to find my body if necessary! So recently I had the pleasure of interviewing The Anonymous Foxhunter as part of my plot to get innocent, impressionable riders hooked on my drug of choice for a Horse Junkies United article. But as often happens when you are working from home, life continues on with little regard for who you may be interviewing at the time. Byron quite helpfully volunteered to get some spaghetti and meatballs started while I was on the phone. “It’s about time he did something without me telling him to!” I thought, and went upstairs to conduct my interview in peace. Twenty minutes in, a Byron-shaped flash darts in front of me, clutching his hand on his way to the bathroom. I raise an eyebrow, but Byron doing strange things is actually pretty normal so I don’t think anything of it until he thrusts his finger in front of my face, which is super bloody and looks like he tried to chop it off, because that is nearly what he did. 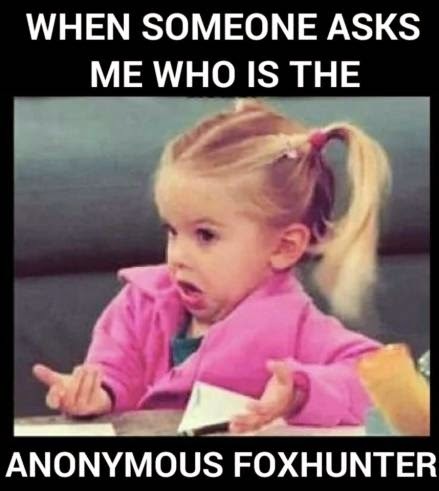 My eyes widen, but The Anonymous Foxhunter is on an anonymous roll talking about anonymous things so all I can really do is sneak into the bathroom, “Uh-huh”-ing my way through about 30 seconds of conversation, grab a towel, wrap it around Byron’s hand, and shoo him out the door. When the interview was over I went to the kitchen to figure out what the hell happened and whether dinner is even feasible at this point. I find a hunk of ground meat which somehow our cats have ignored, and an onion cut in two halves. That’s all it took. One attempt at slicing an onion. The skin was still on it and everything. Sometimes I really don’t know how he has managed to survive this long. I have good news but that will have to wait for a later post…in the meantime, I’ve been writing a lot and riding consistently(ish). Gotta prep for my D rating in Horsemasters Pony Club! In short, all of my rides could be described as: 1) transitions and 2) STOP PINCHING AT THE KNEE GODDAMMIT! Not terribly interesting to write about. In other news, I am super pumped for our hunt ball this spring. I will be wearing this black dress because I already own it, and thus it is already paid for. Byron, on the other hand, will be testing out his brand-new wedding tux. My hair is about twice as long as in this picture now though, so I will be doing my own updo and reliving my Homecoming and Prom days when I would have a bunch of my friends over and do their hair for them! Guess who won horsey Christmas? I hit the Christmas jackpot thanks to my fiance, a riding buddy who dropped a hint as to what would be the perfect gift, Horse Nation, and my family, who never fail to disappoint with weird horse doodads they find in New Hampshire. Absolutely beautiful vintage sandwich case. 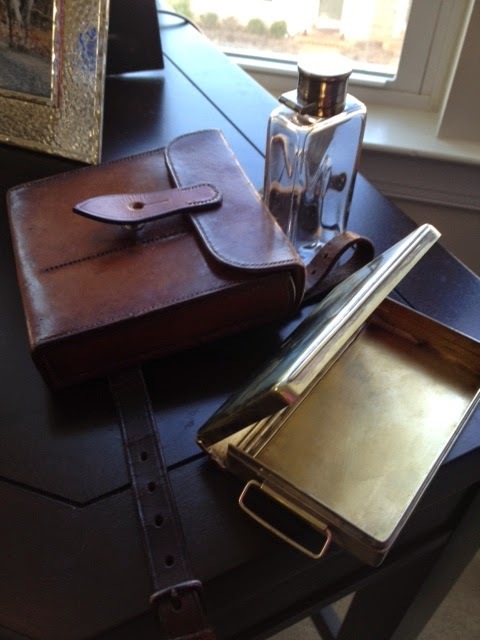 Byron gave me an absolutely wonderful sandwich case with a thick glass flask and sterling silver box inside. I love it!!! 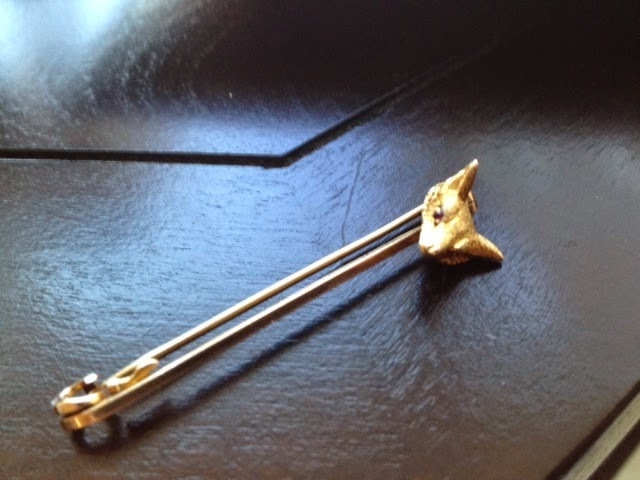 (Even if he does call it a “foxhunting lunch box.”) He also gave me a “foxy” stock pin with tiny ruby eyes. He wins Christmas this year. I got to test out both on my last hunt of the season. Probably for the best that I have to wait to use it again, because I need to have the dry, cracked leather straps on the sandwich case replaced. 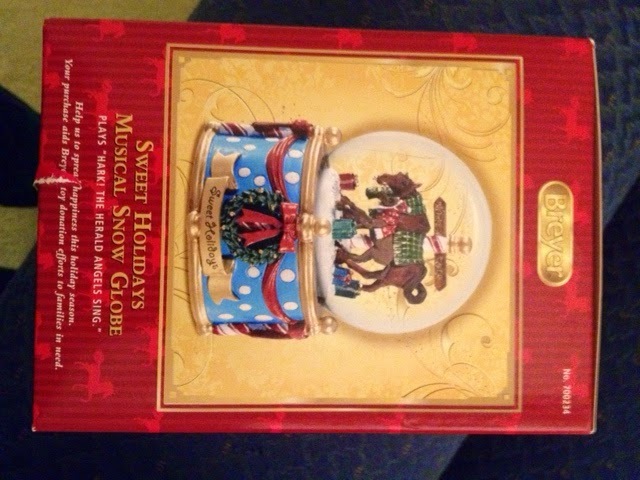 And what Christmas would be complete without a completely weird gift from my non-horsey mom and stepdad? 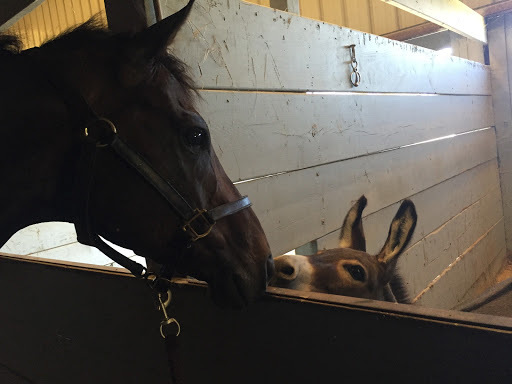 Look closely, because the Christmas mare and foal appear to be swaybacked and wormy. 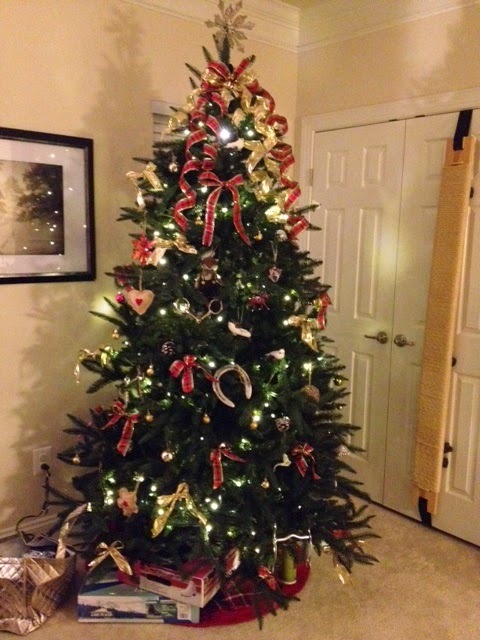 This year was also the first that I succumbed to horsey decorations on the tree. Why fight it and try to seem like a normal person? The bits hanging on the wall right when you enter my house kind of reveal the fact that an insane horse person lives here. I gave my fiance an ornament that looks like him riding his favorite lesson horse, and I just put a bunch of bits and things on there just because it’s better than letting them sit in boxes. 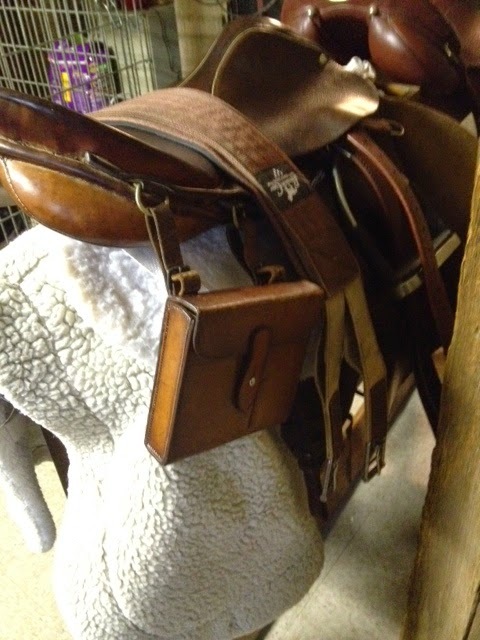 The shoe in the middle belonged to my horse in high school. Merry belated Christmas everyone! What did Santa bring you? So Opening Hunt is next weekend and I am SOOOO EXCITED! I have lined up a horse to borrow as well as transportation. I’ve ridden this saintly horse several times before, including a lesson where I learned some ways to improve my galloping position, and how to ask for a flying lead change (something I have always wanted to learn but never really needed to considering I never showed much), so I feel confident about using him. I have my melton, canary vest, stock tie, and magical hairnet, so I feel confident about how I’ll look. I also FINALLY resigned myself to the fact that my favorite watch is gone forever, and got a cheapo replacement so I won’t be late like the last two times I’ve hunted (only one of which I wrote about…oops). The one thing I am NOT so confident about is braiding manes. I’ve watched a lot of videos so I understand the basic idea, but I’ve never actually done it. And not like that one person who shows up at a schooling show feeling really proud for braiding…until the braid ends up sticking up in all directions, falling out, and frizzing up to such a degree it would have been better not to try in the first place. The day of Opening also marks my fourth year together with Byron and my last anniversary as an unmarried lady. Byron gave me his blessing to go hunting in the morning before we celebrate (not like he had much choice in the matter). Is it wrong that I’m not sure which I am looking forward to more–exploring local wineries in the afternoon, or outriding and outlasting all of the noobs who retire after an hour? Granted, I’ll be on a horse that could hunt in his sleep…but still! This week I’m also riding (not hunting) a horse a local instructor wants to get back into work and sell. He’s a much different ride than the guest/husband horses I have been riding lately…he’s a chestnut 8 y/o Warmblood cross who is a very forward show hunter type. He’s only around 15hh but there is so much movement in that ground-covering daisy-cutter trot! It’s funny, but in the ring when they get quick, I get nervous and tense. Yet out in the hunt field when everyone else is doing it, it’s exhilarating. So, provided that he doesn’t do anything too naughty, I think this will be good for my confidence.